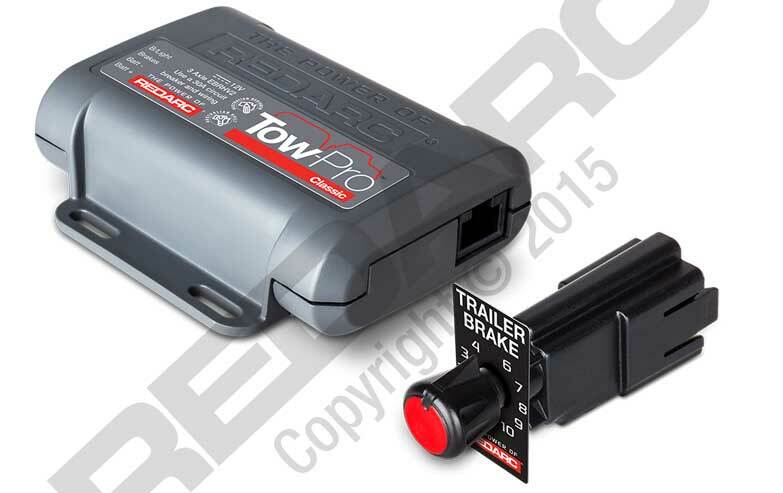 The Tow-Pro range of Electric Brake Controllers sets the benchmark for easy-to-use, safe braking on trailers, camper trailers, boat trailers. Now there’s a REDARC Tow-Pro to suit every towing need and budget! The Tow-Pro Classic Electric Brake Controller is the next generation Electric Brake Remote Head (EBRH), now with the extra performance and reliability of the Tow-Pro platform. It incorporates quality and performance improvements whilst retaining the EBRH look and feel. Suitable for 12 volt systems, Tow-Pro Classic Electric Brake Controller is simple to install and operate and offers a single (user controlled) mode of braking at the turn of a dial with braking force LED indication. The Tow-Pro Classic brake controller is able to operate both electric and electric/hydraulic trailer brakes without manual selection and is AL-KO ESC and Dexter Sway Control System compliant. Tow-Pro Classic offers user-controlled mode of braking allowing the driver complete control of the brake level whether the footbrake or override is applied. The trailer will behave exactly as expected whenever the vehicle brakes are applied and works independently of the vehicle’s brakes. Adjusting the control knob in user-controlled mode will adjust the braking force from minimal (0) to maximum (10).